IMPORTANT MESSAGE: We’ll be saying goodbye to the HHonors Windows Phone app soon, but you can still find all our great travel-planning tools and your HHonors member benefits on the Web. We’ll update you with more details here soon. 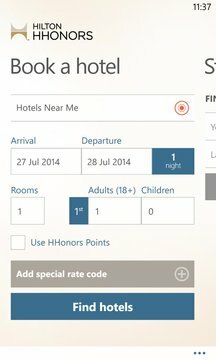 Whether you are an occasional vacationer or a non-stop business traveler, the Hilton HHonors™ app provides you access to easy travel planning tools and all your member benefits to make your on-the-go lifestyle easier. With Hilton HHonors™, you are more than our guest. You are a member, welcomed at our thirteen distinct hotel brands: Waldorf Astoria™, Conrad™, Hilton™, Canopy by Hilton™, Curio™, DoubleTree by Hilton™, Embassy Suites™, Hilton Garden Inn™, Hampton™, Tru by Hilton™, Homewood Suites™, Home2 Suites™ and Hilton Grand Vacations™. 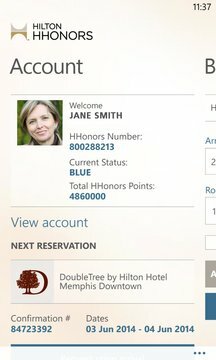 The Hilton HHonors mobile app makes it easier than ever to enjoy your travels and the rewards you earn as an HHonors member.